No ring of the doorbell. Just a text. No tip for the driver? 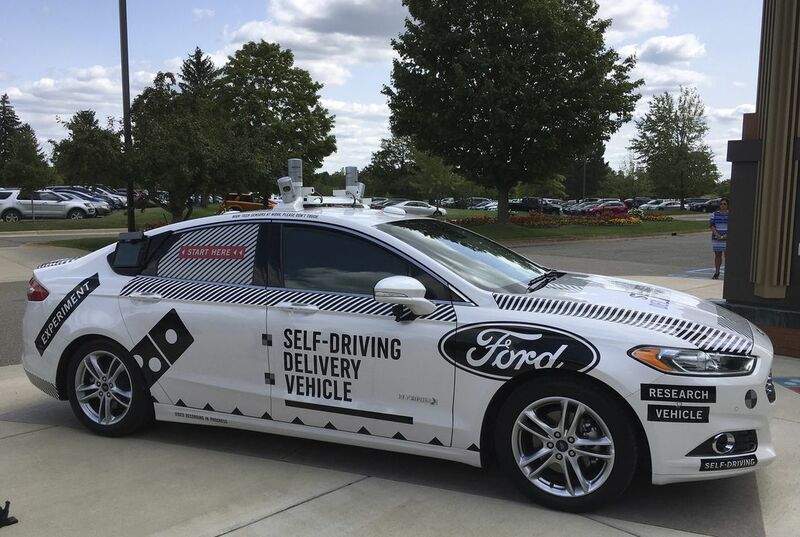 Domino's and Ford are teaming up. They want to see if customers will warm to the idea of pizza delivered by driverless cars. Starting Wednesday, some pizzas in Domino's hometown of Ann Arbor will arrive in a Ford Fusion. It will be outfitted with radars. It will have a camera that is used for autonomous testing. A Ford engineer will be at the wheel. But the front windows have been blacked out. Customers won't talk to the driver. Instead, people will have to come out of their homes. They will type a four-digit code into a keypad. It will be mounted on the car. That will open the rear window. It will let customers get their order from a heated compartment. The compartment can carry up to four pizzas and five sides, Domino's Pizza Inc. says. The experiment will help Domino's understand how customers will interact with a self-driving car. That's according to company President Russell Weiner. Will they want the car in their driveway? Or will they want it by the curb? Will they understand how to use the keypad? Will they come outside if it's raining? Will they come outside if it’s snowing? Will they put their pizza boxes on top of the car and threaten to mess up its expensive cameras? 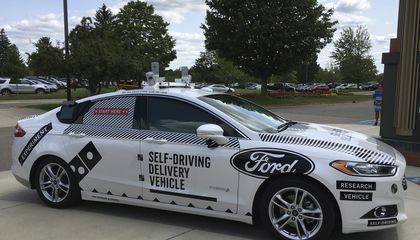 Ford Motor Co. wants to develop a fully driverless vehicle by 2021. It needs to understand the kinds of things companies would use that vehicle for. The experiment is a first for Ford. Other companies have seen the potential for food deliveries. "We're developing a self-driving car not just for the sake of technology," said Sherif Marakby. He is Ford's vice president of autonomous and electric vehicles. "There are so many practical things that we need to learn." Only one car will be deployed in Ann Arbor. It has a special black-and-white paint job. That’s to identify it as a research vehicle. Customers in the test area will be chosen randomly when they order a pizza. They will get a phone call to confirm they want to participate. If they agree, they'll get a text message. It will let them know when the vehicle is pulling up. And it will tell them how to get their food. It lets the customers get their order from the heated compartment. The 4 digit code is important because that's what the customer would have to type in to get to their pizzas in the trunk of the car. you are right because digit code makes sure only you can get to the pizza. So a random person cannot just take a different persons pizza for themselves. It is important because people could just go and take the pizza without paying if they didn't have to enter the code. The four digit code is important so that buyers can get the right pizza. I think that it is important because without it some random guy can just take the pizza that you paid for over the phone. That would be if you could customize the code. If it stays the same then it would be a wast of time. The 4-digit code important because they don't want someone to try and steel the car and they wont beable to steel the pizza.